A great way to increase curb appeal for your home is by painting the exterior. 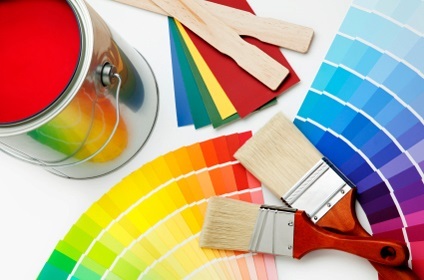 A new paint job is a makeover for the home that can add both value and beauty. With the start of Spring, it is a great time to paint your home's exterior. Pick a sunny day and get painting out of the way before it becomes too hot outside! Follow these strategies for a successful painting experience. Be prepared.​ Before starting your project, complete any exterior repair and preparation. Use a primer, which will help the new coats of paint adhere to bare wood or existing colors and provide a more uniform appearance. Always check the weather forecast before you begin painting.​ Rain or wind will not only impede you from finishing the job, but it may ruin what you have already started. Direct sun can also wreak havoc on paint, so paint the west side of your home in the morning and the east side in the afternoon. Protect everything around your house. ​Before painting, cover all shrubs, bushes, landscaping, decks, sidewalks and any lawn decorations with drop cloths. Also, make sure no foliage is against the house and may rub against the new paint. Paint in order. Begin with windows and trim, followed by the siding. This will prevent ladder marks appearing in the fresh paint on the siding. Always start at the top with siding and work your way down. Save the foundation for last. Painting methodically and in order will prevent unsightly marking or dripping and make your house look fantastic.